How long has it been since we saluted our least-favorite movie ingredient, the Idiot Plot? Too long, I think we all agree. The Idiot Plot, you'll recall, is a movie plot that depends on everyone in the movie being an idiot. If they were not, the movie would be over within 15 minutes and we could all go home. But that never happens in an Idiot Plot; The characters make such incredibly stupid blunders that we're stuck for a whole movie, watching them wander fecklessly through their own lives. "The Hearse" is perhaps this summer's best example of an Idiot Plot. The idiot in the movie is a young woman, played by Trish Van Devere in the spirit of a detergent commercial, who decides to move to a small town to live in the house of her dead aunt. She makes this decision (we learn in a pointless scene with a psychiatrist) because she wants to put the events of the past year behind her. If she'd also put the events of the next year behind her, we'd all be a lot better off. Anyway, she drives to the town late at night, and is almost run off the road by a gigantic black hearse. An ominous sign. Once in town, she's shown around the house by a crusty old attorney (Joseph Cotten) who thinks it should have been his. Site also has a run-in with the local sheriff, who is crude and rude, and with the local adolescent boys, who drive past while she's jogging and scream brainlessly, never having seen such a sight before, I guess. Anyway, Trish moves into the house, and immediately there are the usual ominous signs. Let's see how many I can remember. A music box plays by itself. A door slams by itself. The long-dead aunt appears in a mirror. She appears behind a window. There are footsteps on the stairs. Windows are broken. Doors are broken. The hardware store owner won't deliver to her house. The local minister hints at evil goings-on. While Trish Is taking a shower, the camera gives us a point-of-view shot going up the stairs, approaching the shower curtain ... and then going away (the cameraman was chicken?). On two more occasions, the hearse tries to run her off the road. Every night, another ominous manifestation terrifies her. Every morning, she's jolly again, and goes in to shop at the hardware store and be insulted by the local teen-age louts. Meanwhile, young Tom turns up. He's polite, handsome, old-fashioned. Trish kinda likes him. This proves she's an idiot, since everybody in the audience figures out immediately that Tom is a ghost, and was the boyfriend of the dead aunt. But Trish doesn't know this. She continues to live in this house long after every single member of the audience would have moved back to Rogers Park. This place makes the Amityville Horror look like open house at a condominium. One of the real cheats of the movie is that it never provides a consistent framework for all the terrible things that take place. Things happen without any context: The minister, for example, believes the house is haunted by the devil, and arrives one night with a Bible, rather theatrically screaming, "Get thee behind me, Satan," while obligatory gusts of wind tear at his gray locks. But is Satan involved? Is the house merely haunted? What does the hearse have to do with anything? 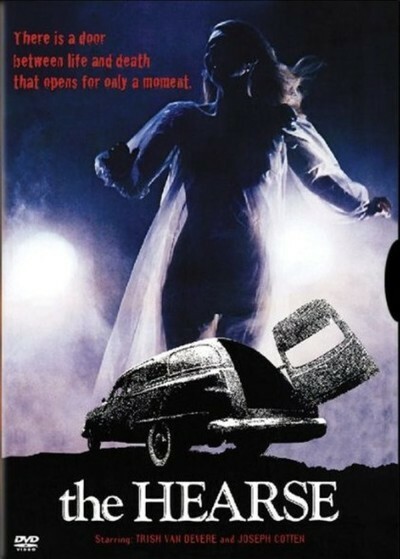 "The Hearse" qualifies as this summer's garage sale of horror movies. It contains all the best clichés from recent, more successful horror movies (especially "Amityville" and even "The Changeling," which came out last April and starred Van Devere, her husband George C. Scott and, of course, the obligatory self-banging doors and self-playing musical instruments). But the clichés exist in a vacuum: The events in this movie happen because they have happened in other horror movies and seemed like a good idea at the time. We know better.